You can play progressive slot machines for a lifetime, and never strike gold and win one of those ever rising and often millionaire making jackpots. However, if you do know the ins and outs of playing such slots there are ways that you can and will be able to increase your winning chances. Progressive slot machines are controlled by a random number generator, and it is at the point in time that you click or tap onto the spin button to send the reels spinning that will determine if the very next spin is going to be a jackpot paying one. But by carefully selecting just which slots you play and often when you play them, you can give yourself more of a chance of winning a huge valued jackpot. So, let me pass onto you the best progressive slot playing hints and tips so that you can then decide just which slots may be worth playing. 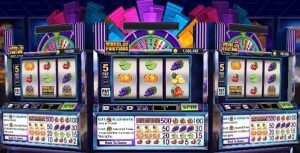 The first thing to be aware of is that some slot games will be designed to award their jackpots or some of their jackpots if more than one of them are on offer much more frequently. Take for example slots offering progressive jackpots that are guaranteed to be awarded before they hit a certain value. In land-based casinos for example, many slots designed by Konami have such jackpots attached and on offer on them. However, you will find many online slots come with a similar set of jackpots, so they are not difficult to find no matter in which playing environment you choose to play. If you see a slot offering a progressive jackpot that is guaranteed to be won before it reaches a value of $500, and the current value of the jackpot is $250 that jackpot is least likely to be won any time soon, however such a slot with a jackpot meter displaying let’s say $480 is going to award that jackpot much sooner rather than later. Several online and mobile slots will have randomly awarded jackpots and will have four different sized one attached to them, and as such you are more likely to win one of the lower valued jackpots if you choose to play off many spins on such slots. One final thing to try and find out is the average value at which a range of different progressive slot machines award their respective jackpots. If you can find out that information, which to be perfectly honest shouldn’t take you too long to discover, then you will be best advised to play such slots when their jackpots are higher in value than their available pay-out amounts. Whilst there are never any guarantees of course that you will win a progressive jackpot, there is a much better chance you will when playing a slot with an overdue jackpot than the chance of you inning a progressive jackpot that has recently been won by another player and has now grown much higher in value that its reset seed value.